Show Racism the Red Card worked in partnership with Dagenham & Redbridge FC and Redbridge Council to organise a memorable full-day educational event, attended by young people from Redbridge Schools at the club’s Victoria Road home. Year 5 & 6 pupils were able to take part in a morning of interactive workshops from SRtRC, which looked at stereotypes and a definition of racism and from the Gypsy Roma Traveller Education Service at Redbridge Council and the Roma Support Group, which focussed on discrimination towards traveller groups. The young people were also able to take in a tour of the stadium as part of their workshop sessions. The pupils from Chadwell Heath, Goodmayes, Mayespark, Ray Lodge and Uphall Primary Schools took part in the sessions enthusiastically and after lunch came back together as one group to take part in the afternoon event, which included a Question and Answer session with a panel of special guests. Dagenham and Redbridge FC showed their fantastic support for the campaign by getting along their manager Wayne Burnett and players Abu Ogogo, Femi Ilesanmi, Chris Lewington and Billy Bingham to field questions. Redbridge Council also demonstrated their support by inviting Cllr Keith Prince, Leader of the Council, David Landau, from Redbridge Equality and Community Council and Superintendent Sue Williams, Redbridge Borough Commander. This fantastic panel was completed by SRtRC patrons and Education Workers, Anwar Uddin, a former Dagenham & Redbridge FC captain himself, Clint Easton and Steven Kabba. The young people’s questions were all about racism and certainly kept the panel on their toes! There were some prizes from the club of pairs of tickets for the next home game, which also happens to be D&RFC’s anti-racism game, for the panel’s favourite questions of the afternoon. 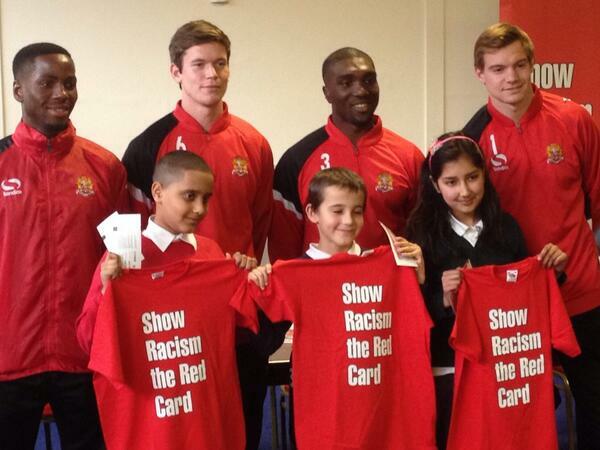 SRtRC also provided T-Shirts for the top three questions. All of the young people who attended received a SRtRC goody bag and a Dagenham & Redbridge FC poster, which the players were happy to sign, to take away with them. SRtRC would like to thank Dagenham & Redbridge FC AND Redbridge Council for their brilliant ongoing support. Both the club and Mike O’Hanlon from Redbridge Council were inducted into the SRtRC Hall of Fame in December and this event was another illustration of their commitment to combating racism.